EASYHEAT® Warm Tiles® Electric Floor Warming Systems have been providing economical, energy efficient warmth under tile, stone, laminates and engineered wood* floors for over 40 years. 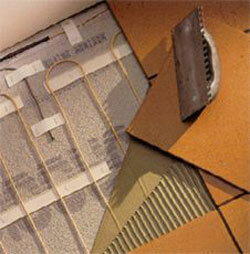 The Warm Tiles system installs quickly in both new construction and remodeling projects of any size or shape. EASYHEAT has one of the strongest warranties in the industry and they are backed by the Good Housekeeping Seal, so you have the assurance of a professional quality floor warming system that’s right for you. An average size bathroom of 30 ft2 (2.79 m2) should take about 2 hours to install the floor warming system.